Sometimes your closet gets boring. We get it. No matter how organized, curated, and color coded your clothing may or may not be, some days lack total outfit inspiration. Don’t fear though, that’s where a little dose of creativity comes into play. 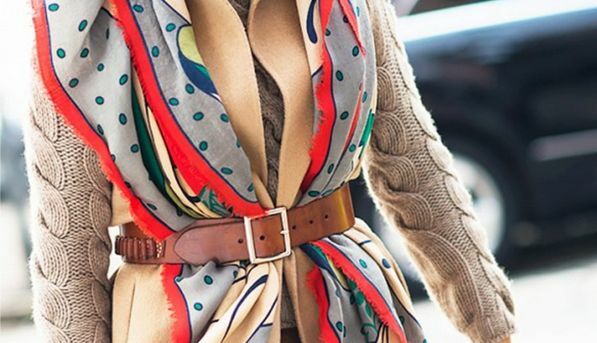 Enter the belted scarf look. You may have seen this look on other blogs, or Pinterest boards, but it wasn’t until this week that I really became a believer. First of all, this is a cozy and warm look. You’re basically wearing a blanket, but also retaining some of your feminine curves via the help of a belted waist. Start with a fitted base. It could be a flowy dress (Hello Olivia P! ), turtleneck, or even a more loose fitting top with a tailored bottom. Don’t limit yourself. Dress in what feels comfortable to you. Choose dramatically. This look doesn’t work with a thin, or short scarf. Think large! Look for something that is at least two thirds the length of your longest layer. Ideally there won’t be too much bulk around the shoulder or waist area, we want this to look long and graceful. Stick with a color palate that compliments your base layer, and don’t fear patterns. Cinch it. Finish it off with a complementary belt. I’ll going to be heavily rotating this idea, especially since I’m on a shopping cleanse until March. Are any of you game to try out this look? Leave me a comment and share a thought or two.